Due to previous commitments I had to squeeze in an analysis of the results from my recent Nikon DSLR survey at the point where we had about 4000 Nikon DSLR user responses (in less than 48 hours). With publication of this article, the survey will now be closed to further entries. Be prepared for some surprises. Okay, maybe those of you who’ve been paying close attention to my postings both here and on various Internet fora might not be quite so surprised. Still, one of my primary calls to Nikon was pretty much verified by this poll: produce the D300s replacement, ASAP. As you may recall, many people who got Nikon’s original poll interpreted that survey as trying to figure out which FX camera they would upgrade to. Surprise, surprise, DX ain’t dead yet Nikon, even though someone in Tokyo seems to be giving it short shrift. Let’s talk about which current DSLR cameras the 4000 survey takers owned, as it’s actually important to the point I’m going to make: 26.1% reported a D800, D800E, or D810 as their primary camera, by far the biggest concentration. D7000, D7100, and D7200 owners made up the second biggest grouping at 20.2%. Since I already mentioned a D300s replacement, the D200, D300, D300s crowd made up 10.9% of the primary camera choices. Before we go any further, ask yourself an important question: which camera do you think all these folk want to upgrade to or supplement their current DSLR with? I’m going to jump to the other end of the survey and report the type of photography people reported practicing, as it might impact the way you interpret the results (or might not ;~). Given that I’m mostly known as a nature photographer, you’d expect those related categories to be high in the list, and they are. 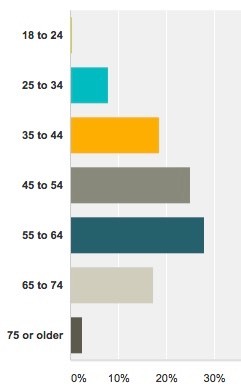 Here are the categories in which a quarter or more of the takers said they partake. Again, balance that against the cameras that were primary cameras. Does this match your expectations? A number of photographic subjects fell just below my one-quarter requirement to report specific percentages: Sports (field), Night, Bird, Architecture, and Black and white would be the next five categories, all near the 20% mark. So what about cameras, you ask? What camera did all these folk want? I asked three basic purchase questions: (1) what of Nikon’s current models would you upgrade to in the coming year; (2) what new camera I defined would you upgrade to; and (3) what new camera I defined would you supplement your current primary camera with. 60.7% of you are not likely to upgrade your current Nikon DSLR to another of the current models in the coming year. Those of you who did consider updating said: D810/D810a (13.5%), D750 (11.5%), and D7200 (9.7%). Nothing else was close or even made it to the 2% level. 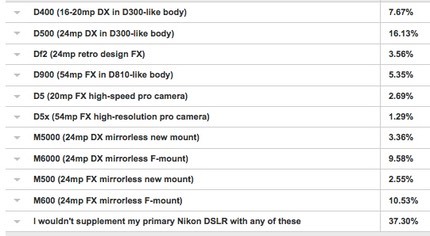 Note that the mirrorless options I gave all tended to be relatively low in takers. What if the new camera purchased was to supplement the current camera? A fascinating answer, actually. 23.8% still wanted one of the D300s followups I mentioned. The 54mp D810 followup slipped to 5.4%, and the 24mp FX mirrorless entry suddenly eclipsed that (at 10.5%). Note: I debated about whether to make this question restrictive to one camera (in which case the totals would come to 100%) or allow multiple answers. In the end I chose the latter because previous surveys from my site show large quantities of multiple body ownership. I wanted to see what these bodies were prior to owning their current primary camera. But what about previous Nikon DSLRs they might have upgraded from? Now isn’t that fascinating? 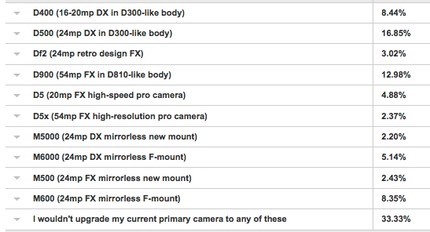 What do these D800/D810 users want next? 15.2% of the group still are thinking about upgrading from D800 to D810. Given all that D800 to D810 upgrading going on and still happening in the future, you’d expect my 54mp D900 upgrade offering to be what they’d move to next. Sure enough 30.6% would upgrade to it. The next highest percentage was 6.8% for a 24mp FX mirrorless camera that used the F-mount. But here’s where things get fascinating: 29.1% would supplement their D800/D800E/D810 with a D300s followup. You read that right, about as many D8xx users would opt to add a high-end DX body to their current camera as would upgrade their current camera to more megapixels. So surely I’d see a change in percentages of types of photography these folks do, right? Not so much. They’re even more Landscape oriented than the overall group (now up to 80.1%), though both Wildlife and Birds showed increases over the average DSLR user surveyed (Birds now over the one-quarter mark). The Travel categories slid down a bit. You might be able to discern from that just how seminal the D300 was to Nikon: yes, it moved one of its most successful previous DSLR customer bases (D70) to a better camera. Yes, it moved the previous camera base upward (D200). But look at those other big numbers. The D300 pulled in a lot of lingering film users as well as some new-to-Nikon folk who weren’t yet using DSLRs but were using digital cameras of some sort. If the D300 user was going to upgrade in the next 12 months, they’d get a D7200 (10.3%) or D810 (11.2%), or a D750 (10%). That’s about it. Give them a D300s replacement and 72.5% would upgrade. But more interestingly, 25.3% would supplement their current D300 with the replacement (I read that as they’d own both). Add those together and yes, we’re near 100%. A D300s replacement is as no-brainer as anything else Nikon could do tomorrow. In terms of the types of photography this group does, I did note that Field sports jumped up to 18.7% and Wildlife shot up to 39.4%. Birds also jumped up to 27.4%. So there’s obviously some that are still using the D300 (and want a replacement) for things that need more frames per second, autofocus, and high ISO performance. I’m not going to go further in analyzing the survey publicly. It does suggest that for the typical readers of this site—who tend to be serious photographers—Nikon’s big options are to entice current Nikon DSLRs users to upgrade to a 24mp DX pro performance camera that replaces the D300s, plus a 54mp FX upgrade to the D810. So judge what Nikon launches (other than the D5) by that filter. And since I just mentioned the D5, there’s definitely a smallish group that wants that camera (mostly currently D3 to D4s owners), and there’s an equal sized group that wants a D5x version. So, bottom line: if Nikon wants to shore up their high end: D400, D950, D5, D5x. That’ll do it. To Nikon: if a Japanese Nikon executive is reading this and wishes access to the full survey data, I’d be happy to supply it, as I’ve done with some previous surveys. All it takes is to contact me directly.